Is there a security update for the Intel ME firmware for my Razer Blade Stealth 13" (2019)? Where can I find the latest drivers for my Razer Blade Stealth 13 (2019)? To enhance the user experience, drivers for your Razer laptop are available through Windows Updates. Simply navigate to Settings > Update & Security > Windows Update and select “Check for updates” to ensure that you have the latest drivers installed on your Razer Blade Laptop. The original preinstalled drivers for your Blade can be found by visiting the “Software & Drivers” link on the left-hand side of the page. How do I add creator mode to my Razer Blade Stealth 13 (2019)? Please click here to find out more about Creator Mode and enabling it on your Razer Blade Stealth 13 (2019). What is the difference between the different models of the Razer Blade Stealth 13 (2019)? Keyboard Keyboard with Razer Chroma™ single-zone full key backlighting and anti-ghosting technology. Does the Razer Blade Stealth 13 (2019) feature Chroma Lighting? The Razer Blade Stealth 13 (2019) features RGB lighting powered by Razer Chroma. Single-zone means that only one of the 16.8 million colors can be selected at a single time. Users can choose a static color or cycle through the range of colors using Razer Synapse 3. How does the layout of the Razer Blade Stealth 13 (2019) differ from previous versions of the Blade Stealth? The following are the physical layout changes on the Razer Blade Stealth 13 (2019) compared to the previous versions. Thunderbolt port is now located on the right side. Power button is now on the keyboard. What are the dimensions of the Razer Blade Stealth 13 (2019)? Does the Razer Blade Stealth 13 (2019) feature a vapor chamber? No, the Razer Blade Stealth 13 (2019) features copper heat pipes. Can I use the Razer Power Bank to charge the Blade Stealth 13 (2019)? Yes, you can charge the Razer Blade Stealth 13 (2019) via the USB-C power out from the power bank. Does the Razer Blade Stealth 13 (2019) support Miracast? Yes, the Blade Stealth 13 (2019) supports Miracast. Is the Razer Blade Stealth 13 (2019) compatible with the Core/Core V2/Core X? Yes, the Blade Stealth (2019) features a Thunderbolt™ 3 port with 4 lanes of PCI Express and external graphics support for support with Razer Core, Razer Core V2, and Razer Core X. Most of the battery improvement options are part of the Windows OS. Check the Battery Saver settings for the most effective means of conserving battery when on-the-go. The battery life may be extended further by turning down the display brightness, adjusting the power settings in Windows, changing the performance mode in Synapse 3.0 software, closing applications, and dimming or turning off the keyboard lighting. What do the different colors on the Blade Stealth (2019) LED status indicator mean? When the system is on and in use, the LED will normally be off except under the conditions mentioned above. The LED will also not light up when the unit is turned off, even if the adapter is plugged in and charging. Note: The status indicator is not an HDD indicator. Can I dual boot, partition, or otherwise modify the Razer Blade Stealth’s operating system? The Razer Blade Stealth is designed for compatibility with the as-shipped OS. Should you want to install or modify the OS, please format the boot drive first then install your OS. Razer Warranty and Support is only available for the as-shipped OS. What is the approximate weight of the Razer Blade Stealth 13 (2019)? Where and when will the Razer Blade Stealth 13 (2019) be available? The Razer Blade Stealth 13 (2019) laptops will be available starting December 4th, 2018 from Razer.com and select retailers in the United States and Canada and coming soon to the United Kingdom, France, Germany, Nordics, China, Australia, Hong Kong, Japan, Singapore, and Taiwan. Is the Razer Blade Stealth 13 (2019) supported by Synapse 3.0? Yes, it is supported by Synapse 3.0 and comes pre-installed on the system. Can I upgrade the SSD on the Razer Blade Stealth (2019 Model)? Yes, you can upgrade the SSD. The base model configuration comes with a 256GB SATA SSD. The Graphic Model configurations come with either a 256GB or 512GB NVMe PCIe SSD. The M.2 slot can use either a SATA or NVMe PCIe SSD. The mSATA and the M.2 NVME both take the 2280 size dimensions. NOTE: Detailed steps on how to upgrade components are not available. Instructions from other sources may be available but we cannot be responsible for their content. Any damage or issues caused during installation or as a result of incompatible parts being used is not covered under the warranty and may void the warranty coverage. Razer will not be liable for any warranty coverage on any third-party part you may install and we cannot guarantee compatibility or performance of any third-party parts. Do all models of the Razer Blade Stealth 13 (2019) come with NVIDIA graphics? Select models of the Blade Stealth 13 (2019) include NVIDIA graphics. The “Base” model does not include NVIDIA graphics and uses Intel “integrated” graphics. Do the Razer Blade Stealth 13 (2019) models that feature NVIDIA graphics include NVIDIA Optimus technology? Yes, to help maximize battery life the Razer Blade Stealth (2019) NVIDIA Graphic Models switches between the integrated and dedicated graphics processing. NVIDIA® Optimus™ technology intelligently optimizes your notebook PC, providing the outstanding graphics performance when you need it and also extending your battery life for longer enjoyment. What type of games will run on the Razer Blade Stealth 13 (2019)? The Razer Blade Stealth features mobile-focused NVIDIA GeForce MX150 graphics card with 4GB of VRAM. This allows games like Overwatch, Fortnite, WOW, LOL, and similar class games to run smoothly. More graphic demanding titles may require the settings to be lowered or the additional use of Razer Core external graphics (Sold Separately) to run at higher settings. How many speakers does the Razer Blade Stealth 13 (2019) include? The speaker count has doubled and now includes 4 upward firing speakers. What is the battery life of the Razer Blade Stealth 13 (2019)? The Razer Blade Stealth 13 (2019) includes a 53Wh battery and can achieve up to 13hrs on the Intel graphics base model, up to 11hrs on the FHD Graphics Model, and up to 8hrs on the 4K Graphics Model. Actual battery life varies depending on product configuration, software, usage, power management settings, and other factors. Does the Razer logo light up on the Razer Blade Stealth 13 (2019)? No, the logo on the Razer Blade 13 (2019) now features a subtle tone-on-tone design that does not light up. Can the RAM be upgraded on the Razer Blade Stealth 13 (2019)? No, the RAM is fixed. This allowed Razer to achieve a thinner laptop design. 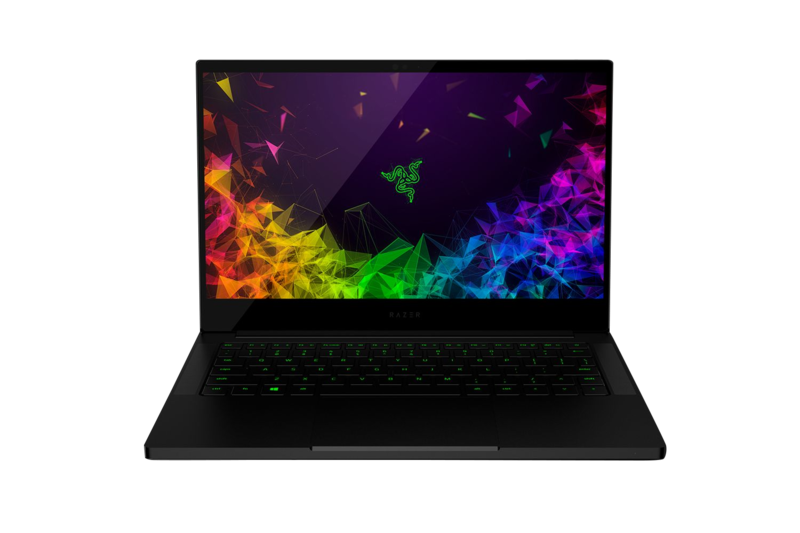 However, the Razer Blade Stealth 13 (2019) is available to order with up to 16GB of RAM. Does the camera on the Razer Blade Stealth 13 (2019) support Windows Hello? Yes, the camera on the Razer Blade 13 (2019) is a 720P IR camera with Windows Hello support. What generation is the USB-C port on the Razer Blade 13 (2019)? The USB-C port on the Razer Blade Stealth 13 (2019) is Gen 2 USB-C 3.1. Razer Blade Stealth batteries should be replaced by an authorized Razer Repair Center. Should you feel your battery is defective and needs replacing, please contact the Razer Support team and we will be happy to assist you. Can I use third-party power adapters with the Razer Blade Stealth? How long is the warranty on the Razer Blade Stealth? The warranty length for the Razer Blade Stealth is 1 year. Please check out the full details of warranty lengths on our website. Warranty length and duration may vary according to local laws. What is the refresh rate of the Razer Blade Stealth 13 (2019)? The refresh rate on the Razer Blade Stealth 13 (2019) is 60Hz and can be configured in the Razer Synapse 3.0 software. Can you charge the laptop from both of the USB-C ports on the Razer Blade Stealth 13 (2019)? Yes, you can charge the laptop using the included 65W power adapter on both the Thunderbolt™ 3 and USB-C port of the Razer Blade Stealth 13 (2019). What are the specs of the Razer Blade Stealth (2019) models? Check out our website to see the full details on our new Razer Blade Stealth 13 (2019).